Anxiety is a common and natural feeling that everybody experiences. If anxiety is significantly interfering in your child's everyday life, then it is important to get help. Anxiety disorders can be treated effectively. Anxiety is one of the most common problems experienced by children and young people. Anxiety is a common and natural experience. Many people feel it, regardless of their age. Anxiety is a normal response when faced with something that is threatening or dangerous, embarrassing or stressful because it prepares us to manage the situation. For children and young people, there are common fears that are often associated with age. For example, infants develop fears of separating from their parents. Young children often fear insects and animals. Most children are also scared of the dark or will imagine that there are monsters under the bed. Teenagers also have many anxieties including worrying about fitting in and being judged by other people. Performance anxiety is common amongst children and young people competing for high levels of sporting or academic excellence. Anxiety is one of the most common problems experienced by children and young people. Both boys and girls are affected. Sometimes the anxiety can be greater than that of their peers and interfere with the young person's life - how they manage on a day-to-day basis. This may be a sign that an 'anxiety disorder' is developing and treatment for this may be necessary. People who have an anxiety disorder are more likely to worry more than other people and be more sensitive to danger. Research has also indicated that anxiety can run in families who may have vulnerable genes. When parents are anxious, then children can learn that they should also worry a lot. Negative events that have happened in a person's life can also cause anxiety. For example, if a dog bites a person, then that person can continue to be scared of dogs. Anxiety is usually experienced in 3 different ways: physical feelings, thoughts and behaviour patterns. Physical sensations of anxiety are a result of the body becoming more aroused. This is often called the fight-or-flight response and refers to the body doing a number of things to prepare for quick action or a quick escape from the potential danger. Changes that result from the fight-or-flight response can be: increased heart rate, heavy or rapid breathing, stomach aches, nausea, vomiting, diarrhoea and headaches. Thoughts associated with anxiety are usually related to worrying about threat or danger or that something bad is going to happen. Children and young people may have difficulty talking about their worries. Behaviour patterns that are a common part of anxiety include fidgeting, pacing, crying, clinging, or shaking. Avoidance is the main behaviour pattern of anxiety. This can be obvious like refusing to do something they are fearful of, such as going outside when it's dark, or it may be subtle, like staying with someone they know so they don’t have to talk to strangers. There are different types of anxiety disorders, which all have a different key feature. These are fears about particular objects or situations. Some common phobias include fear of the dark, dogs, heights, injections and needles. This is the fear of being away from a main caregiver. Children will become very upset when they have to separate for any reason, and will try to keep their parent(s) with them at all times. Often the fear is that something terrible will happen to the parent or the child when they are apart. This is a general tendency to worry about all sorts of things and expect the worst to happen. Common areas that they worry about include their schoolwork, relationships, health, burglaries, sport performance. This is a fear or worry about social or performance situations, and children are often described as shy. The main problem is a fear that people will think badly of them. This is a form of anxiety where there is a pattern of distressing thoughts and repetitive actions that are difficult to overcome. For example, children may worry about dirt or germs continually and may wash themselves repeatedly, even though they are not dirty. This is a fear or worry about having panic attacks in situations where most people would not be afraid. Panic attacks involve a sudden rush of fear and a number of physical feelings. It is important to know that signs and symptoms of anxiety disorders may be shared with other childhood problems (for example, depression) and can require professional help to assess properly. If anxiety is having a significant impact on your child’s everyday functioning and preventing them from participating in activities that their peers can comfortably do, this is a sign that you should seek help. It is important that an assessment takes place by a professional who knows about anxiety in children and young people. Physical examinations are also recommended to ensure that there is no underlying illness causing the symptoms. Research has shown that a form of psychological therapy (cognitive behavioural therapy) is effective in learning ways to overcome or manage anxiety. Your doctor may recommend medicine if the anxiety is very severe or if there are multiple difficulties at the same time (such as depression). If your doctor does prescribe medicine, then psychological therapy should also be part of the treatment. Going to your family doctor is the best first step as they will be able to provide guidance about where to get more help. This may involve a referral to a counsellor in the community or to a local child and adolescent mental health service who can provide specialist assessment and interventions for anxiety. What can I do to help my child with anxiety? There are 2 things that parents often do to help their child who is scared of something - giving reassurance by telling their child that everything will be OK and allowing their child to avoid the situation. Unfortunately, these 2 behaviours keep the anxiety going. Rather than reassure when your child is anxious, give praise when their anxious behaviour has stopped. Giving reassurance is a natural response but when a child is anxious, it often doesn't work. It means your child will keep asking for more the next time they are in an anxiety-provoking situation. Reassurance is positive attention which rewards the anxiety. Anxiety can then become a positive thing. As the adult, you need to remove your attention from the anxious behaviours and focus by praising when the anxious behaviour has stopped. You need to tell your child that it is the anxious behaviour you are ignoring, not them. Name the anxious behaviour for them. To keep telling your child to do something they don't want to do can be distressing for you and your child. It can be easy to give in and let your child avoid the situation. But, avoiding the thing causing anxiety means your child is less likely to overcome their avoidance and cope with their anxiety. It's better to push your child a bit so that they start to do things that are slightly difficult for them. That way they learn to realise they can cope with their anxiety. 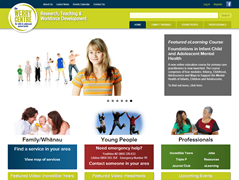 The Werry Centre for Child and Adolescent Mental Health fact sheets. Rapee, R. M., Spence, S. H., Cobham, V., Wignall, A. 2000. Helping your anxious child: A step-by-step guide for parents: Oakland, CA, US: New Harbinger Publications, Inc. Feeling down, worried or stressed? Take control with SPARX! SPARX is a computer programme that helps young people with mild to moderate depression. It can also help young people who are feeling anxious or stressed. Watch a short video for an introduction to SPARX (click on the picture). The Mental Health Foundation provides free information and training, and advocate for policies and services that support people with experience of mental illness as well as their families/whānau and friends. Helping young Kiwis understand and deal with depression. Free text 5626 for help. Anxiety Canada is a leader in developing online, self-help, and evidence-based resources on anxiety and anxiety disorders. They are the developers of the free MindShift app which helps youth and young adults manage anxiety, using step-by-step strategies based on psychological treatment. This page last reviewed 14 December 2018. Feeling down, worried or stressed?